Thanks to the folks at Walloh (who you can check out by clicking the link at the bottom of this page), I was given an opportunity to see the second film about a prominent figure of the dance world that I’ve seen in a month, and right away I will say that Yuli: The Carlos Acosta Story – or just Yuli, as it seems be officially known outside of marketing – is far superior to The White Crow; at least this movie actually has things happening in it. The title of the film, written by Ken Loach regular Paul Laverty and directed by his partner Icíar Bollaín, is not the only thing that the marketing seems to be slightly misleading about; its advertising, including the way that the synopsis is laid out, suggests that the film’s subject, Cuban ballet dancer Carlos Acosta, is playing himself for a majority of the film about his life, but while he is definitely in the film he appears more so in a number of wraparound segments spliced in between scenes with him as a child and as a young man, with actors playing those respective parts. It’s not so much like what they tried – and failed – to do with last year’s The 15:17 to Paris by casting the actual figures as themselves in a dramatized format of their lives, but a little more like how they were incorporated into American Animals, with them appearing in between the parts where they’re played by actors (although this one is not in the format of a docu-drama like that movie); that, I feel, is a slightly more accurate way of putting it than suggesting it is Acosta who prominently features in the film role as himself. None of this detracts from the film itself, which is a fascinating and intriguingly executed depiction of young Acosta’s life; it starts with him as a young boy (played by newcomer Edlison Manuel Olbera Núñez) growing up in a small and impoverished neighbourhood in Cuba, until his stern father Pedro (Santiago Alfonso) forces him to attend a local prestigious ballet school. His relationship with his father is shown to be somewhat rocky over the years; there are moments where the two share true affection and support for one another, including when young Carlos is given the nickname “Yuli” after a great warrior, but there are also times when Pedro’s overbearing paternal instincts result in him fronting a very controlling household, even giving the young boy lashes from his belt when he finds out he’s been skipping classes. That last part is on little Yuli, though (not the abuse, but the truancy, just to be clear); despite his teachers and his family recognising some extraordinary dancing talent within him, he is less than enthusiastic about his new vocation and would rather play football in the mud instead of learning how to pirouette. Over time, though, he manages to perfect his talent, and as a young man (played by another newcomer, Keyvin Martínez) is invited to be a guest performer with ballet companies around the world from London to Houston to even his native Cuba, with the latter in wraparound segments that see the real Acosta choreographing and even performing in a dance-filled representation of his life for an upcoming stage production. In these segments, we get to see Acosta and other dancers perform a series of interpretive dance sequences, designed to reflect certain parts of his life that we see acted out during the film’s main body, from his abuse at the hands of his father to his catapulting into fame and recognition in the dance world. The sequences themselves are outstanding, filled with incredible dancers that exhume passion and sophistication into every single leap they take, with Acosta himself obviously shining in the few instances where he does actually get to strut his stuff on stage; it’s an interesting way to tell this particular story, as it incorporates a traditional dramatic narrative while also showing in full the very nature of what it is that Acosta would become known for, in a feat that certainly sets it apart somewhat from other movies about dancers, especially The White Crow which didn’t have as much of a stylistic flare as Yuli does. The dramatized portions of the film do follow a more traditional biographical storytelling format, and between Icíar Bollaín’s direction and Paul Laverty’s script they do a solid job at keeping the momentum going even when all they are doing is just telling this guy’s life story to the audience. It’s decently paced, very well-acted – both younger incarnations of Acosta do incredibly well for people that have no previous credits to their name – and as a result you actually care about this guy as he goes from the hardships of his childhood, which not only has him dealing with his stern father but also sees him witness mental illnesses such as depression and schizophrenia cloud over some of his other family members, to becoming a revered and respected dancer, all while grasping with his own search for identity in a life where everything was organised for him against his will. Anyone who’s either familiar or unfamiliar with Carlos Acosta will find this an intriguing introduction to his life and career, as it does well enough at telling his story that it makes you curious to read up a little more about him. It’s a drama about dance where both the dance and the drama neatly go hand in hand with each other, which makes me a little more frustrated with The White Crow for not doing any of those things, even when dealing with a slightly meatier figure in the dance world such as Rudolf Nureyev; it falls flat where Yuli: The Carlos Acosta Story leaps in bounds, in almost every aspect. 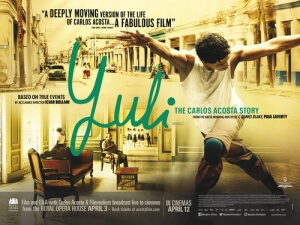 Yuli: The Carlos Acosta Story is an intriguingly told biopic of the famous Cuban dancer, neatly incorporating both a strong sense of drama and some outstanding dance sequences to make this particular story leap far.